You want something "different". You're tired of thinking about it and talking about it. You're ready. You want action. You want results. Suze makes it happen. Tired of beating yourself up for not living what you know to be true? 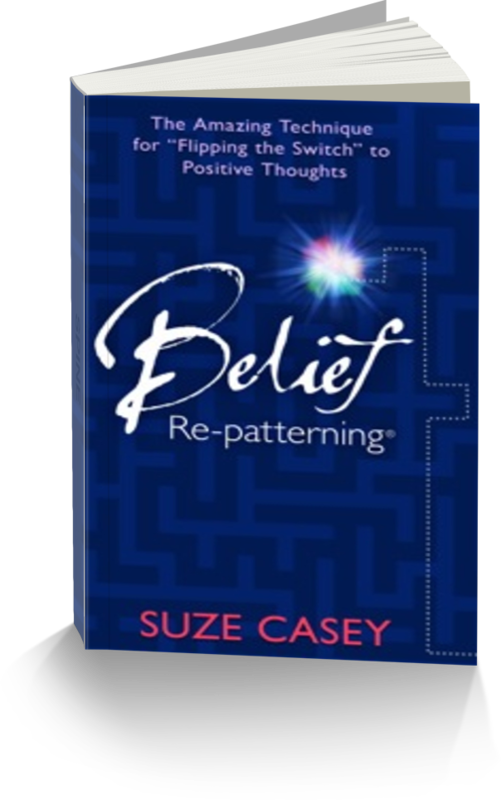 Reset old thought patterns,learn the autopilot option for positive thinking...purchase your copy today! Train your subconscious mind… Every day, for 365 days, you’ll receive a focus word or phrase designed to raise your vibration – directly from me to your mobile device. Beginning...now. Learn to use the Belief Re-patterning technique yourself. Take an online course from anywhere in the world and create your personalized self-nurturing path. Give yourself that gift... now. – Please stop making promises to yourself that you won’t keep – set your intentions for 2016 realistically. – You did the very best you could in 2015 – congratulate yourself for the successes – both large and small, and build on those strengths in 2016. – Review your year and look for the seeds of 2015 you wish to grow in 2016. I forgive myself for believing I need to do “better” next year. I give myself permission to focus on all the learning, growth and success I’ve had in 2015. I can make my resolutions from what didn’t go well last year, or I can set intention with the seeds I’d like to grow. Since whatever I focus on expands, I choose to grow using my successes from last year as my foundation! I am free to identify and nurture the seeds that create more of who I really am and what I really want. I am moving forward, creating a solid foundation for growth. Whether you are imagining your future, or reflecting on your past – be present to the appreciation of who you are – and do both with kindness and compassion for yourself. Holding the space for you to step into more of who you really are this year. Honoured to continue to supporting you. Enjoy the gift of this day! The post Time for Reflection appeared first on Belief Re-patterning.